Cinderella is a tale of magic and wish fulfillment, stitched together from equal parts hard work and happily ever after. At the Stroke of Midnight captures the diverse color palettes of the ball and her day-to-day life and is versatile enough to add a little magic to your memories. This kit is packed full of sparkle, patterned papers, and Cinderella’s classic shade of blue, dropping hints of the story like her lost glass slipper. In addition to thematic elements, this kit is a treasure trove of flowers, ribbons, and bows—perfect for everyday scrapbook pages too. At The Stroke of Midnight comes with two different alphas to mix-and-match and make all your wishes come true. This kit comes with TWO extra packs – glitters and a set of damask papers! PLUS an extra alpha! Purchase this during it’s first week of release for 1/2 off. Amy made this beautiful word art pack to add to this collection. I made two layouts. 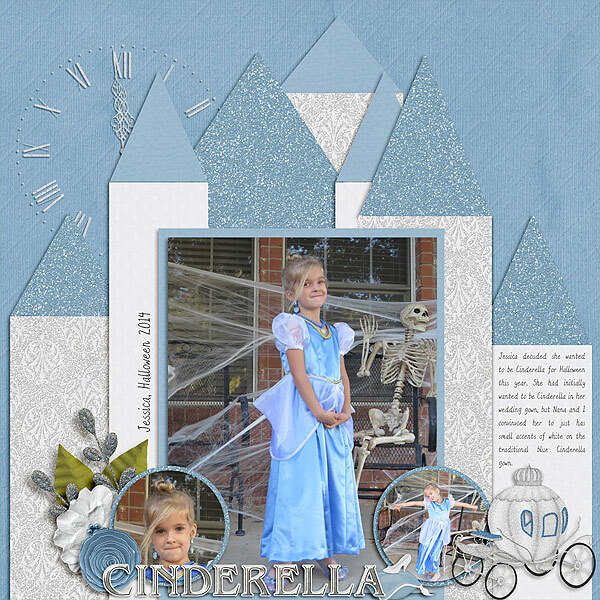 First up is a layout from last Halloween of Jessica dressed up as Cinderella. 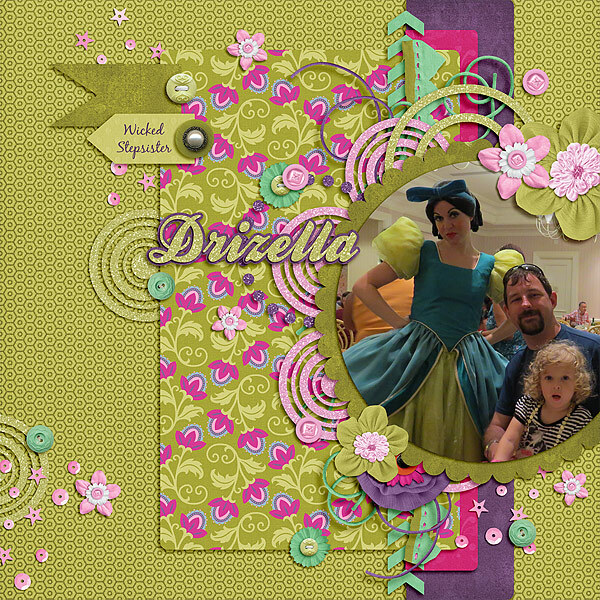 Then I used the more colorful aspects of the kit to scrap a page about meeting Drizella, one of Cinderella’s wicked stepsisters, last summer at Disney World. I need to do a coordinating page for meeting Anastasia, the other stepsister. Here is a look at what the rest of the CT did with this kit. Here is a Freebie for you to download for Beth. Preview is linked. Life is a highway and you might as well explore. Whether your travels take you through Radiator Springs or just down the road, Start Your Engines has you covered. 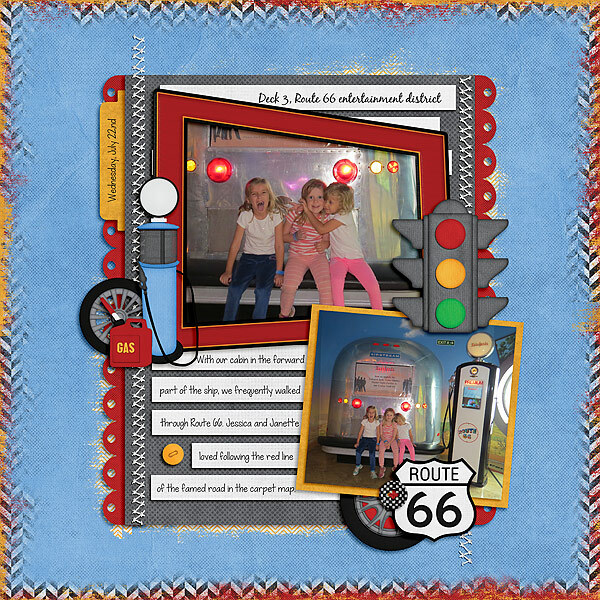 This fun, bold colored kit is jam-packed full of patterned papers and elements to “get your show on the road”. Featured elements include cars (of course! ), tires, gauges, traffic lights, and tools – as well as more traditional scrapbooking staples like flowers, ribbons, and banners. It also comes with a full alpha, perfect for spelling out what you’ve seen. Document your adventures on the open road with Start Your Engine. You can also get this kit 1/2 off during the first week of release. Previews are linked to the store. Here is the fun word art the Amy made with this kit for your to add. The preview is linked. I have one layout using Start Your Engines. It’s from the Alaskan cruise we just returned from last week. There is an area of the Disney Wonder, the ship we cruised on, that is called the Route 66 entertainment district. Here is what the rest of the CT came up with. It really makes me want to visit Carsland at Disneyland.